The MC.31xx series allows simultaneous recording of two, four or eight channels with sampling rates of 1 MS/s, 10 MS/s or 25 MS/s. Due to the proven design a wide variety of 12 bit A/D converter boards for CompactPCI 6U and PXI 3U can be offered. 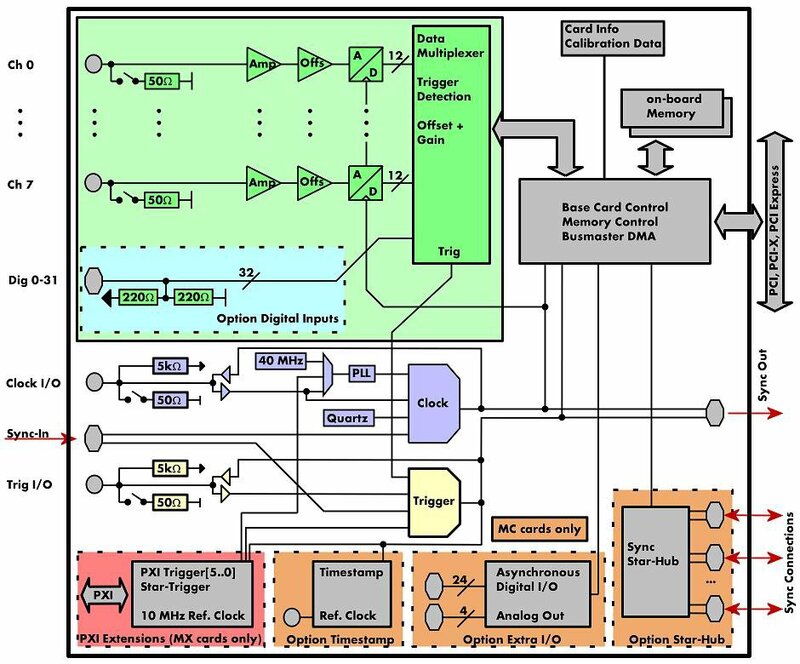 As an option 4 digital inputs per channel can be recorded synchronously making a total of up to 32 additional digital channels for mixed-mode operation. CompactPCI combines the advantages of the PCI bus with the needs of the industrial user. CompactPCI uses well well known and stable 19" technology and offers robust systems for industrial needs. The defined cooling power and the robust connector extend the life of the product. CompactPCI systems are defined in two different sizes: 6U and 3U. The CompactPCI 6U products from Spectrum have the same product range as the PCI pendants (former MI series). 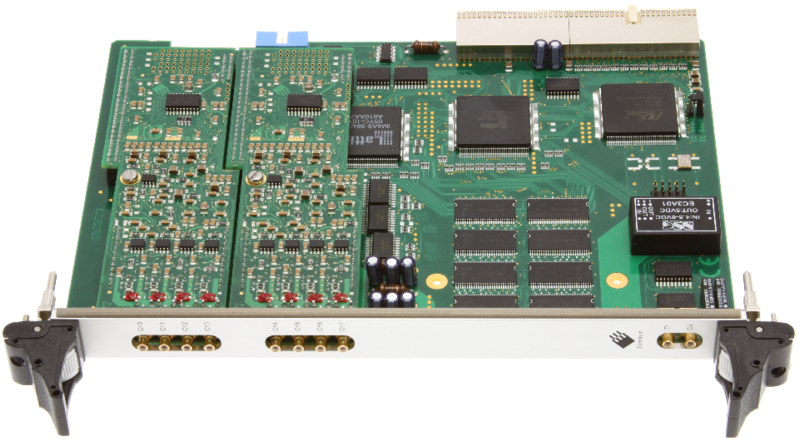 The cascading option synchronizes up to 4 Spectrum boards internally. It's the simplest way to build up a multi channel system. On the internal synchronisation bus clock and trigger signals are routed between the different boards. All connected boards are then working with the same clock and trigger information. There is a phase delay between two boards of about 500 picoseconds when this synchronization option is used. The Extra I/O module adds 24 additional digital I/O lines and 4 analog outputs on an extra connector. These additional lines are independent from the standard function and can be controlled asynchronously. There is also an internal version available with 16 digital I/Os and 4 analog outputs that can be used directly at the rear board connector.